In a ninety-minute Worldwide Developer Conference keynote featuring Apple CEO Tim Cook and Senior Vice President of Software Engineering Craig Federighi, Apple threw back the curtains on the next versions of both iOS and OS X.
Unsurprisingly, iOS becomes iOS 8, but with OS X, the big question was what California location would donate its name. Federighi played up the eventual choice, suggesting that Apple’s product marketing team had driven all around the state in a Volkswagen Microbus, trying out the sound of OS X Oxnard, OS X Rancho Cucamonga, and OS X Weed before finally choosing OS X Yosemite. Much as the concept of OS X Weed was amusing, tying the name to Yosemite National Park feels like an excellent choice, evoking scenic grandeur along with historical and scientific importance. Both Yosemite and iOS 8 are available for developers now, with the final release promised for “this fall,” which likely means somewhere in the September-October-November time frame; if history is any guide, look for them in mid-to-late October. 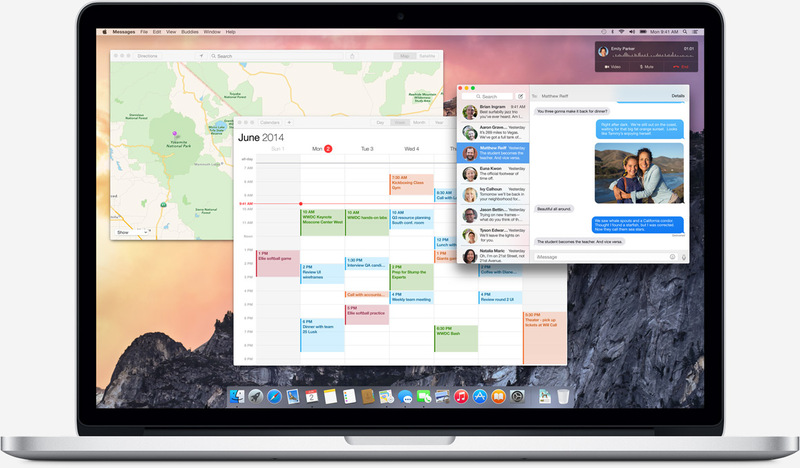 In keeping with the previous releases, both will be free, but in a break from tradition, Apple will be making pre-release versions of Yosemite available to the public soon as part of the OS X Beta Program. Ars Technica has a full list of supported devices for both Yosemite and iOS 8, but in short: most Macs since 2007, the iPhone 4s and later, and the iPad 2 and later. Notably missing from the keynote were any hardware announcements: no new Mac mini, no new Apple TV, no iWatch. But that’s not to say that there was any lack of shiny new software features to talk about between the two new operating systems and their core apps. We’ll be digging in to what the announcements mean in future articles, but for now, let’s just look at what Apple said. 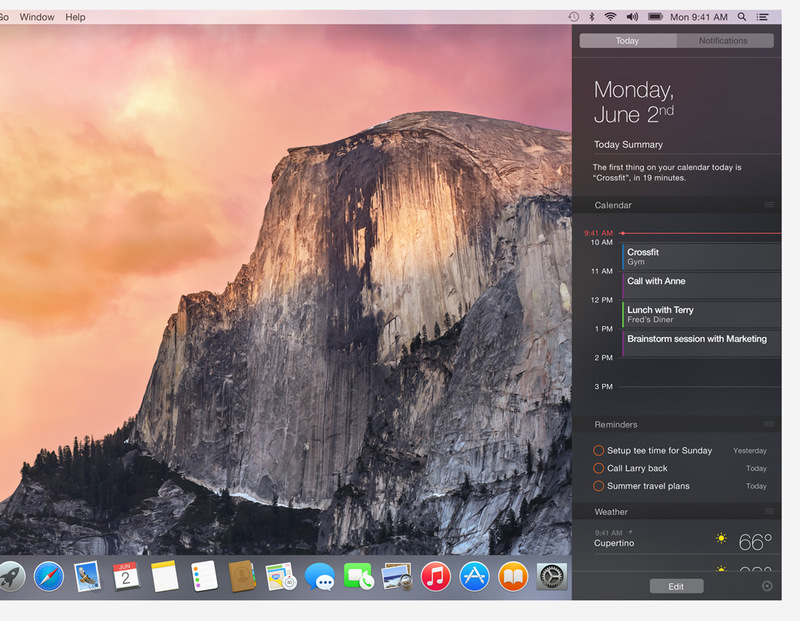 OS X Visual Redesign — The biggest change coming to OS X Yosemite is its new look, largely inspired by iOS 7. Lucida Grande, which has been the system font since the earliest days of Mac OS X, has been replaced by what appears to be Helvetica Neue, which is iOS 7’s system font. Of course, the changes don’t end there. Expect more white and pastels in Yosemite, along with redesigned, iOS 7-inspired app icons. However, the icons haven’t entirely lost their “Mac-ness.” For example, the icons for Contacts, Calendar, and Reminders are still tilted at an angle, instead of standing straight up as in iOS. Perhaps the biggest change from a usability standpoint is that for many of Apple’s core apps, the toolbar and title bar have been merged, compressing controls into less space and leaving more room for content. It’s likely that independent developers will follow suit. Another potentially shocking change is how the red, green, and yellow “stoplight” window controls work. They are now flat, and no longer resemble pieces of candy. But more important, the green button no longer “zooms” a window, which was always unpredictable, but now serves as a “full screen” button. The current full screen button, which sits in the upper-right of the window, goes away in Yosemite. The Dock works the same as before, but it has been “flattened.” The 3D effect of the background on which the icons sit is gone, replaced with a simple, semi-transparent 2D background and more visible dots to indicate running apps. Speaking of transparency, Federighi made a big show out of the new transparency effects — which he referred to rather oddly as a “material” — in Yosemite, which are most visible underneath sidebars and title bars. As in iOS 7, the effect is subtle, showing more of a hint of the background instead of being completely clear, like a pane of glass. Frankly, the feature feels like showing off — it’s computationally difficult but functionally irrelevant — and it will make taking clean screenshots all the harder. Continuity Brings the Mac and iOS Together — With a set of features collectively referred to as Continuity, Apple is attempting to make the experience between the Mac and iOS even more seamless. For starters, AirDrop will finally work between Macs and iOS devices, so you can transfer photos and documents between your devices without resorting to email or iMessage. That in itself is welcome, but Continuity goes much farther. One of Apple’s most impressive new features for both OS X and iOS is Handoff. Start editing a document on one device, say an iPad, and when you move to your Mac, click an icon in the Dock to continue editing there. It works seamlessly among all Apple’s devices. Another welcome feature is that, in Yosemite, your Mac will be able to link up with your iPhone to send and receive SMS messages and phone calls. Messages on the Mac will show SMS messages from your poor “green bubble friends” (as Federighi called them), and you’ll be able to make and answer phone calls from your Mac, and use your Mac as a speakerphone. Yosemite will even show the Caller ID information when your phone rings. You’ll also be able to call a phone number from a Web page in Safari. This feature works between the iPhone and the iPad as well, so you’ll be able to make and receive calls from your iPad. Finally, Apple unveiled Instant Hotspot, which makes connecting to an iPhone hotspot easier than ever. You will no longer have to enter a password or fumble with your phone, but instead just select it from the list of Wi-Fi networks, even if your iPhone is across the room. This works on both the iPad and the Mac. Unmentioned with regard to Continuity is location-based awareness for notifications, a drum that Joe Kissell has been beating for several years (see “An Alarming Abundance of Alerts,” 13 May 2012). We can hope that Apple will add some awareness of what device is primary, so a text message or reminder doesn’t have to set off alerts on all your devices simultaneously. 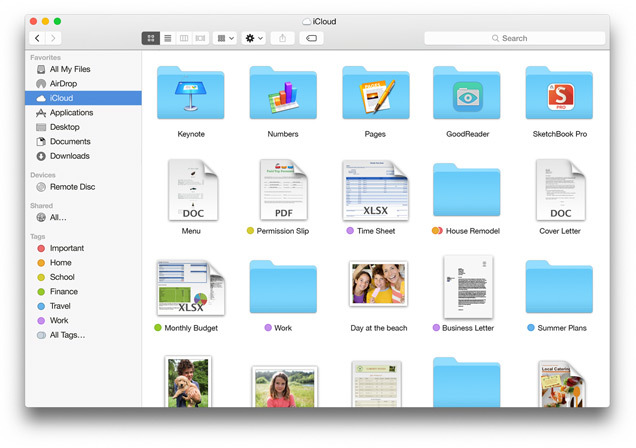 iCloud Drive — Remember all that speculation about how Apple should buy Dropbox? (We played off that in last year’s April Fools issue in “Dropbox to Become iOS File System for Real?,” 1 April 2013.) No acquisition will be necessary, since Apple will be introducing iCloud Drive with iOS 8 and Yosemite (or any PC running Windows 8). iCloud Drive appears on your Mac’s Desktop like any other drive and becomes available in any iCloud-enabled app in iOS. That may sound a bit like the current Documents in the Cloud feature of iCloud, but iCloud Drive goes further, letting any of those devices access any file within iCloud Drive, much as Dropbox and the other “document provider services” (as Apple has started calling them) provide now. Edits made on any device appear automatically on all other devices, again just like Dropbox. This has two key implications: first, that iCloud documents will no longer be restricted to a single app, and second, that iOS apps will now be able to share files between apps, something that was previously impossible and led to awkward copying of files between apps. What Apple said nothing about, either in the keynote or on the iCloud Drive description on the Web, is if it will be possible to share files and folders in iCloud Drive among different people, as well as among apps on your own Apple devices. iCloud Drive may end up being useful for isolated users, but not to those who need to share files more broadly with colleagues. Photos — One of the biggest pain points in iOS has been photo management. As the iPhone’s camera has evolved, the images it takes have grown larger, taking up more precious storage space. Stopgap solutions like iCloud’s My Photo Stream, with its byzantine limitations, have only added to the confusion. Worse, although you can edit and organize photos on a device, there was no centralized archive where that effort could be made available to all your other devices. No more. Now all of your photos will be stored in iCloud, accessible from any device. In the iOS 8 Photos app, you’ll be able to search your entire library of photos, as well as smart suggestions for what to look for. iOS 8 will also bring more powerful editing tools. You can automatically crop and straighten photos, as well as make “smart adjustments” that will automatically tune exposure, brightness, contrast, and more. But what about the Mac? A new Photos app for the Mac is promised for early 2015 that will provide access to your entire iCloud photo library, and will presumably offer the same features as its iOS counterpart. We don’t yet know what this means for iPhoto or Aperture, but we’re willing to bet that at least iPhoto’s days are numbered. Disappointingly, free iCloud storage space is still limited to a paltry 5 GB, but Apple announced more generous pricing tiers, including 20 GB for $0.99 per month and 200 GB for $3.99 per month. Tiers will be offered up to 1 TB, though Apple did not reveal further pricing. Spotlight — First, there was LaunchBar, whose roots date back to NeXTSTEP and which came to Mac OS X in 2001. But in 2005, Apple introduced the search technology Spotlight as part of 10.4 Tiger, seemingly challenging LaunchBar’s role as a keyboard-based launcher. In reality, though, Spotlight was never serious competition, lacking LaunchBar’s adaptive abbreviation search algorithm, which can learn, for instance, that typing MSW should launch Microsoft Word. In Yosemite, Spotlight is receiving a major upgrade, and while it may still not match LaunchBar’s adaptive abbreviation search algorithm, its new feature may put it front and center of your usage. Literally too, since Spotlight now appears in the center of the screen, rather than in the upper right corner. What’s most interesting is that Spotlight no longer limits its searches to local data, but extends its reach to Wikipedia, Bing, Maps, Yelp, and more. And Spotlight’s search results attempt to be significantly more useful, going beyond a link to the result to the actual information you want. Look up a contact in Spotlight, and you don’t need to switch to Contacts to see her phone number, email address, or a map to her office. Recent conversations in Messages and Mail are also integrated into such search results, all presented in an attractive layout right in front of you. That applies to Web-based information as well, with data pulled from a variety of sources and formatted for quick consumption. Although Spotlight got more attention on the Mac during the keynote, perhaps because the iOS version of Spotlight has been able to search the Web and Wikipedia for some time, the new version of Spotlight graces iOS 8 as well. You’ll be able use it to search the Web, Wikipedia, breaking news, nearby places, Apple’s various online stores, movie show times, and more. Safari — Once again, a new operating system has brought significant interface changes to Apple’s Web browser. 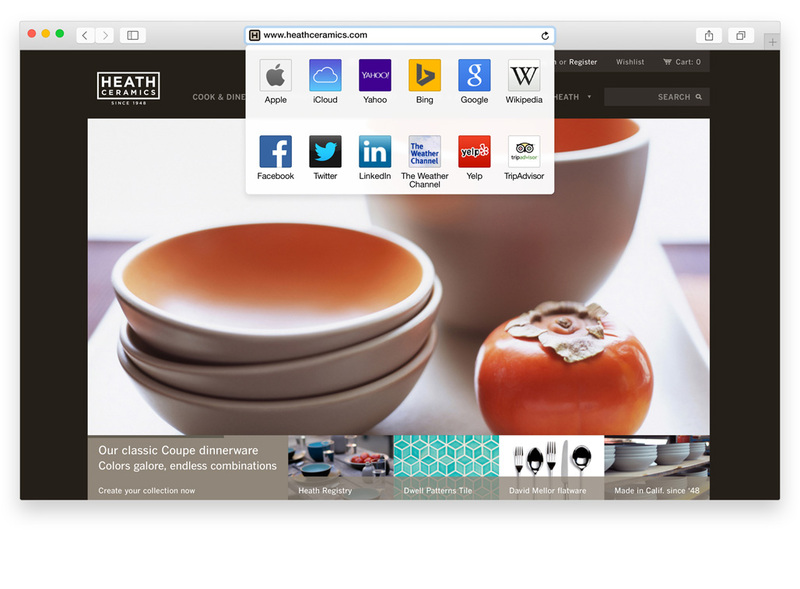 Safari in Yosemite features a streamlined toolbar that incorporates almost all the features available in the tab bar and Favorites bar of the Mavericks version. Bookmarks, for example, appear when you click the search bar, as well as in search results. Searches performed from the search bar also provide Spotlight suggestions and Wikipedia links right at the top. RSS feeds are back: they now appear in the shared links list — this is the list that Safari in Mavericks displays in its sidebar. When you’re sharing links, Safari in Yosemite displays recipients of recent shares you have made, so you can quickly amaze/annoy your friends with yet another cute otter picture without taking a trip into Mail. A new tab view shows all of your open browser tabs and collects those from the same site into stacks. You’ll be able to enable Safari’s Private Browsing on a window-by-window or tab-by-tab basis, much like Google Chrome’s Incognito windows. In iOS 8, Safari gains features from its Mac counterpart. The tab view from Safari for Yosemite is also available in Safari for iOS 8, and the iOS version also gains the Mac version’s sidebar of bookmarks, the Reading List, and Shared Links. Mail — Mail in both iOS and OS X is getting some much requested improvements (though not necessarily all the improvements that some of us at TidBITS would like). In Yosemite, Mail gains the Preview-like capabilities to annotate documents and fill out forms inside the app itself. Mail also simplifies the act of sharing large attachments by uploading the attachment to iCloud and then providing a link to the attachment inside the message itself: attachments as large as 5 GB are now possible. Mail for iOS gets even more new and revised capabilities than its OS X sibling. Swipe direction in your mail list now matters: a left swipe in the list still provides the ability to trash or flag a message, but a right swipe will mark a message as unread. Mail has become more intelligent about a message’s content, too: items like addresses and phone numbers within a message evoke a notification at the top of the screen. You can add an address or phone number notification to Contacts; dates and times in a message offer a notification for adding an item to Calendar; and so on. Lastly, a hugely welcome new feature enables you to dock a message you are writing at the bottom of the screen so you can consult other messages, in the event you need to confirm a fact, or copy some information or a URL to the message you are composing. Notification Center — The big news about Notification Center in both Yosemite and iOS 8 is widgets from other apps. The Mac’s Notification Center now supports widgets, and both platforms will now support custom widgets, prompting speculation that the long-ignored Dashboard may be going away. Notification Center for the Mac now boasts the iOS 7-style Calendar preview, including the Today view, as well as Weather, Stocks, World Clock, Calculator, and Reminders. As an example of third-party widgets in iOS 8, Federighi showed off adding an ESPN widget to Notification Center. Another welcome feature is interactive notifications. In iOS 8, you’ll be able to respond to text messages, email messages, or calendar invites directly from the notification, either from the lock screen or at the top of the screen while using the device. This will also work with third-party apps like Facebook, so you could like or comment on Facebook posts. Messages — The marquee new feature of Messages on both iOS 8 and Yosemite is voice messages. Click or tap the new microphone icon, record your message, then swipe up to send it. On the iPhone, simply put the phone to your ear to hear the message. Taking a cue from Snapchat, the message expires two minutes after being heard, unless you elect to keep it. Also, in iOS 8, you’ll be able to take a video and send it directly from Messages. As with voice messages, videos vanish after two minutes unless you choose to retain them. A desperately needed new feature is better management of group messages. Now you can add and remove people from a group conversation, name threads, and leave a group conversation. Hopefully this will reduce the common problem of people accidentally typing in the wrong conversations and should make Messages better for ongoing group messaging. You can also enable Do Not Disturb for individual threads that are receiving too many messages at inopportune times. More interesting, you will be able to share your location from Messages, as a sort of ad-hoc Find My Friends. So if someone asks “Where are you,” you can both show and tell. Locations can be shared for an hour, until the end of the day, or indefinitely. Another welcome refinement is being able to see all attachments in a conversation, instead of having to dig through to find pictures and other things. We hope that you’ll be able to delete attachments from this view, since threads in Messages can become quite the storage hogs. Other New iOS Features — Apple has added a number of other neat features to iOS 8 that could dramatically change how you use your devices. Extensibility: iOS apps will finally be able to talk to each other! For example, Pinterest can add the option to share a Web page to its app from the Safari sharing sheet. This also means that Safari will effectively have extensions, such as 1Password and LastPass. One example that was shown was using Bing Translate to translate text on a Web page into English. Family Sharing: Apple is, at long last, making it easier to share iTunes content with your family members. Up to six people in your household can share content from iTunes, the App Store, and the iBooks Store without sharing accounts, as long as those accounts all use the same credit card. Parents will also receive notifications when their kids try to make a purchase, and can approve or decline those purchases from their own devices. Family Sharing also promises to link together calendars, photos, and location data, though we don’t yet have details on how this will change the current features. Predictive and Third-Party Keyboards: iOS 8 takes a big cue from Android in the keyboard department, adding two long-existing Android features: predictive text and third-party keyboards. Predictive text works much like it does in Android, showing a bar above the keyboard with a list of words or phrases that iOS thinks you want to appear next. Predictive text will be available in 14 countries at launch. iOS 8 will at last support third-party keyboards, such as the popular Swype for Android, which lets you draw a line across the keyboard to spell out words, and Fleksy, which has so far been relegated to its own iOS app and an API. We expect to see a number of exciting new keyboards in the App Store over the next year. Contact Shortcuts: iOS 8’s app switcher will also show favorite and recent contacts at the top of the screen. Tap one, and you can quickly call or message that person. Health: Health-tracking devices abound these days, such as those from Fitbit, and Apple’s new Health app, along with the HealthKit API for developers, will bring them all together in a single place. Not only will Health securely integrate information from these devices, but it can also link up with your healthcare provider. While not terribly exciting just yet, Health could be a game changer in healthcare over the long run. App Store: Expect more App Store refinements in iOS 8, including a new Explore tab, badges for Editor’s Choice apps, discounted app bundles, video previews, and a new TestFlight service for beta-testing apps. Alas, the common developer requests of demo versions and coupon-based discounts weren’t mentioned. Siri: Everyone’s favorite personal assistant will be learning some new tricks, including Shazam song recognition, the capability to purchase content from the iTunes Store, and 22 new dictation languages. Swift Programming Language — We’d like to close out this overview with something a little outside our normal beat — a new programming language. It has been years since Apple introduced such a thing, but those who have been waiting for the next HyperTalk/Dylan/ScriptX to come flitting out of Cupertino might want to check out Swift, which Apple describes as “an innovative new programming language for Cocoa and Cocoa Touch.” Designed to live seamlessly inside of developer projects alongside both C and Objective-C code, Swift is optimized for working with the programming frameworks used to build both Mac and iOS apps. Swift also comes with a Playground, within which developers can try out code in real-time, providing live views of animations and timelines that present the state of a variable as the code runs. While Swift may not be of interest to most Mac and iOS users, it has profound implications for computer instruction in secondary schools and endeavors like App Camp for Girls (see “App Camp for Girls Rocks Macworld/iWorld,” 11 April 2014). The Swift Programming Language guide is already available for free download from the iBooks Store. It will be interesting to see if the iOS Photos will allow photos to be actually moved to folder/albums and/or for the albums to sync on other devices through the Cloud Drive or via a cable. I went to see the system requirements for Yosemite but the only thing I found was in the Public Beta Section where I was told you have to have Mac OS 10.9 installed on your Mac before you install Mac OS 10.10. So it seems there is no way to go direct from Lion or Mountain Lion to Yose-mite. Bummer. It's likely, once Yosemite is at release stage, that it will install over any version of OS X that is compatible with the Mac App Store and that is running on a compatible. That most likely means 10.6.8 and later. This is why we'll need Joe Kissell to write "Take Control of Upgrading to Yosemite." Interesting article but despite being a Mac user for well over 20 years I don't want an Apple only environment. I want to be able to choose devices from all manufacturers based on their merits which of course means using third party offerings available cross platform. To see the new icloud drive not being offered on Android is a case in point and precisely why I'd rather stick with DropBox et al rather than Apples limited offering. Sure my Mac gets the work done but then so does my Android tablet (and dare I say it my ancient Palm phone). I've heard that the translucency can be turned off, though I haven't had my hands on the beta to check that for myself. The new programing language would be reason enough for me to upgrade. I've spent a fair amount of time working with Objective-C and after look over the free language guide, I've found I really like Swift. But I don't know about having all my photos etc. in icloud. I'm often in places with either no internet or a non-functionally slow internet. There would have to be a way around this problem. I have to assume that putting your photos in iCloud will be optional - they'll still be local to your device. The problem that's being solved is dealing with the fact that you take photos on multiple devices and can't possibly store them all on anything other than a Mac. I hope Yosemite doesn't take all the circles off buttons, as in iOS, making us have to read a whole screen to find an action. But I'm really excited about a lot of these new features, which will make my clients' lives easier. It looks like the button borders have been removed in Safari, Mail, and in Finder windows, but the buttons themselves are visibly distinct from the background on which they sit.